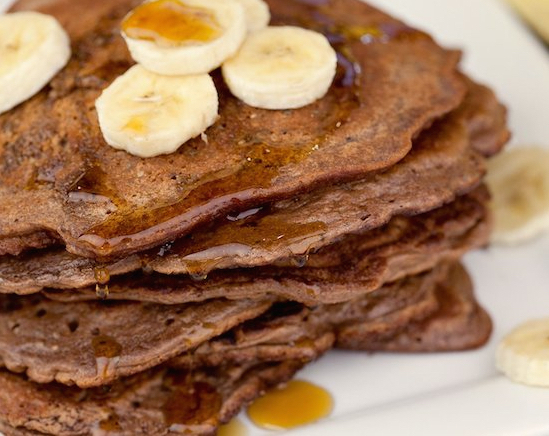 You may have seen a similar flour-less pancake recipe before (hard to believe that a banana and eggs can whip up some pretty tasty pancakes), but I especially like adding protein powder for the extra boost and flavor. You can also substitute the protein powder for cocoa powder. Mix 1 ripe banana, 2 eggs, and 1 scoop of chocolate protein powder (or cocoa powder) in a blender or food processor. You can also whisk them by hand, just be sure to mix well. Set your griddle or frying pan to a low-medium setting, spray it with Pam or spread on a little butter, and then pour or scoop the batter on the griddle just like you would regular pancakes, only make them small! They tend to be a little flimsy, so the smaller you make them, the easier they will be to flip. They will require about 2 minutes on each side, but use your spatula to lift up the edges and check your progress. Feel free to add a dash of cinnamon, coconut flakes, chocolate chips, or anything else you’d like to the batter– no harm in experimenting! If you would rather have them plain, just stick with the banana and eggs and omit the protein powder. Puree strawberries or raspberries to use as a syrup. This only makes a serving for one, so double or triple the recipe if you need more. The riper your bananas, the sweeter your pancakes will be. If your bananas aren’t ripe enough they will be difficult to blend.